The Pre-Engineering curriculum focuses on engineering practices relative to problem solving, conceptual and product design, programming, manufacturing, documentation, and presentation. Applications to these processes include, but are not limited to: 3D modeling, robotics programming, rapid prototyping, conventional and CNC machining, and digital electronics. The program follows the Project Lead the Way (PLTW) curriculum, which provides a hands-on, real-world problem-solving approach to learning. Students oftentimes work in teams, which enables them to improve their communication, organizational, and critical-thinking skills. Students in the Information Technology academy follow the PLTW curriculum. The curriculum ignites students' interests early and strengthens it over time through engaging, problem-based learning. This program is comprised introductory, foundation, and specialty courses, such as Computer Science, Computational Problem Solving, and Software Engineering. Advanced PLTW courses include Simulation and Modeling, and Cyber-Security. The IT academy prepares students for leadership positions in the IT field, and emphasizes ethics, teamwork, and analytical, problem-solving, and communication skills. In 2018, a robotics elective was implemented into our high school's curriculum, allowing students who have never been a part of an engineering, computer science, or robotics program to learn and explore what STEAM fields have to offer. The curriculum is based around the systems and concepts that are involved in constructing and designing a FIRST robot. Students learn about engineering principles in applications of robotics, operation of hand tools and machines, application of the engineering design process, programming languages, and theory and design of robotic systems. Throughout the course, students are to keep a daily log of their process of constructing a robot, and at the end of the course, students compete in an in-class robotics competition. Starting in 2017, our high school began offering after school engineering college courses as part of the 21st Century Program. 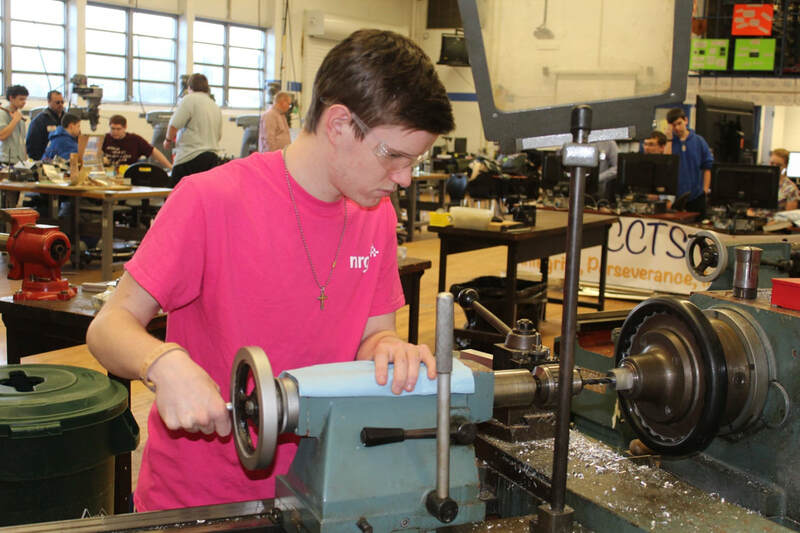 Students are offered the opportunity to take course work in design, machining, programming, and other topics. The team has developed an after school club as part of the school's 21st Century Community Learning Center program for students with an interest in learning more about robotics. This club introduces future Team 203 members with technical training in design, tools, machining, programming, and other skills in accordance to our pre-season workshops.